Testing employees on their comprehension of online training and e-learning materials is often thought of as something of a necessary evil. I mean, nobody especially likes taking a test, right? But by spending a little extra time thinking about why and how they’re designing a pre- or post-training quiz, designers can transform what was once a dull formality into a fantastic learning opportunity for both the trainer and the trainee. 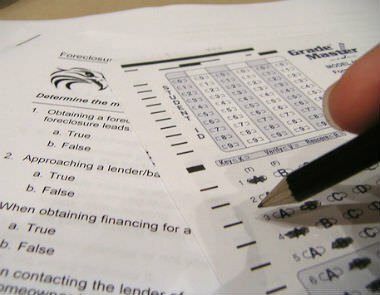 Attaching quizzes to online training programs serves a number of purposes. Often, passing a post-training quiz is the requirement for program certification. But online testing can accomplish much more. First, though, it’s worth considering why you want to quiz employees. First off, think about what exactly your training program is trying to accomplish. Is it intended to alter real-life workplace behavior — like preparing employees to better close on sales leads? If so, the ultimate measure of your program’s success isn’t likely to be a test. It’s actual lead-conversion rates. It’s worth considering whether devoting time to crafting an online quiz is going to be beneficial. Testing does — or at least it can — accomplish a lot, especially in an online setting, where instructors aren’t necessarily able to use verbal (and non-verbal) clues about what materials are most important to focus on. In that case, online quizzing can help reinforces the most important, take-away points from a training program. It can also measure, or grade, a large number of learners instantaneously; it can help trainers identify the rapid and slower learners in their organizations; it can help identify organizational strengths and weaknesses; and it can help establish company-wide skill-level benchmarks. Training programs can sometimes get a little long on “ideas,” and short on “actions.” If you’re training employees to change behaviors, it’s important that the quizzes you devise focus on ways to translate ideas or concepts — — into real-life work scenarios — practice. Memorizing terms and concepts alone won’t alter behavior. If you’ve determined that quizzing is the best route to gauging a program’s success, then it’s time to get down to designing a test. Typically, online testing comes in four flavors: True/False statements; sequencing, matching, and multiple-choice statements. Employees who engage in harassing, offensive, or inappropriate conduct off-site and after work hours cannot be reprimanded for their behavior. According to several employees, Sarah and Josh made racist jokes during a recent off-site party for a retiring colleague. When the offensive conduct was brought to management’s attention, employees were told that Sarah and Josh couldn’t be reprimanded because the party was held off-site and after work hours. Is management right or wrong? A.) Right — Employee conduct at off-site and after-hours events is not the employer’s responsibility. B.) Wrong –Employees who engage in harassing conduct off-site and after hours can be reprimanded for their behavior. Sometimes T/F questions really can’t convey the complexity of a task or skill you’re testing for. Sequencing works especially well when trainers aren’t physically able to observe a trainee performing a newly learned task. For instance, if you’re training someone how to log into a new computer system, but you cannot literally watch them do it themselves, unscrambling a sequence of events involved in getting on to the new system can at least simulate the steps the trainee needs to master. Multiple choice questions, like True/False ones, are often totally dependent on the way they’re written. And again, the key is to focus questions on real-life scenarios. Imagine new-product training: Instead of quizzing trainees on every new feature of the product — say, a new line of computers — quiz employees on which attributes of the computers could fill a potential customer’s demands. Quality over quantity: Focus on crafting fewer, smarter questions rather than hundreds of rote ones. Open, close with a quiz: By opening training with a quiz, you can signal to a learner what topics are going to be important, and also set a benchmark so you, and the employee, can see how far they’ve come by the end of the training. Focus on actionable, practical work-related scenarios, and test how trainees are able to implement their newfound knowledge to those situations. Avoid questions that only quiz for straight-up recall ability. Image used under Creative Commons by Flickr user Casey Serin.